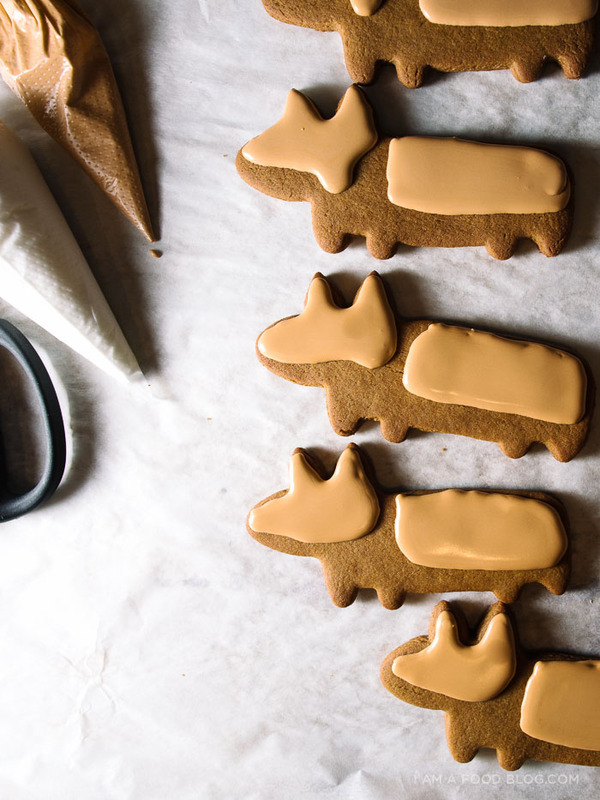 I know the season of gingerbread is over, but I couldn’t resist making these little gingerbread corgis. I get that gingerbread is associated with Christmas, but I think it’s really a winter cookie; I love the warmth of the spices and fresh gingerbread out of the oven on a cold day can’t be beat. Of course these guys aren’t right out of the oven – they’ve had a lot of time to cool off before being decorated. Decorating cookies with royal icing is something that I find deeply satisfying. I even had a short stint as a professional cookie decorator. Real talk: I just decorated cookies and sold them at a local bake sale, but it’s kind of sort of like being professional, right? 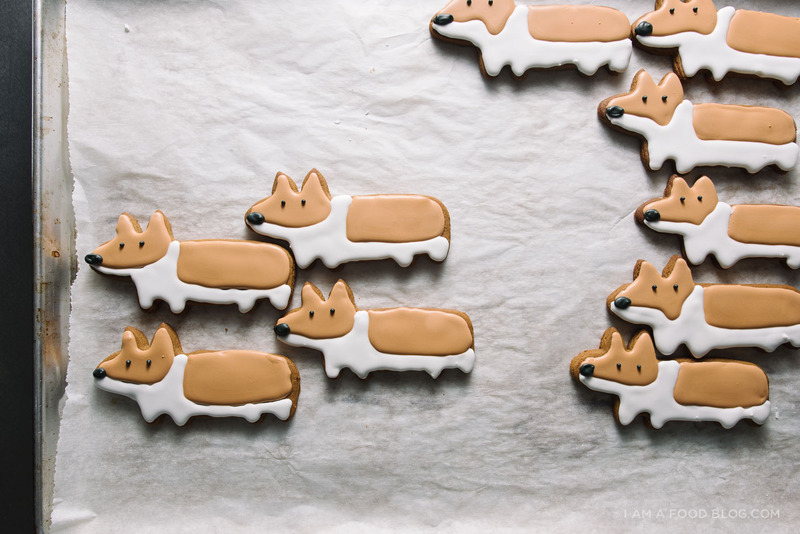 Anyway, these corgi cookies are so cute that after I finished decorating, I stared at them for a good five minutes. Mike walked into the kitchen and asked me what I was doing and I was so entranced that it took me a couple of seconds to reply. Corgis are one of my favorite dog breeds (dachshund are the other) and I’m forever trying to decide if I want a corgi dog or a wiener dog. I feel like they both have really good qualities and are kind of similar. They both have short legs and long bodies and are absurdly cute. Both breeds seem to have fun personalities too. To be honest, some of my favorite Instagram accounts are actually dogs. 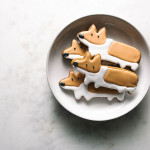 Dogs just too cute, like these cookies. 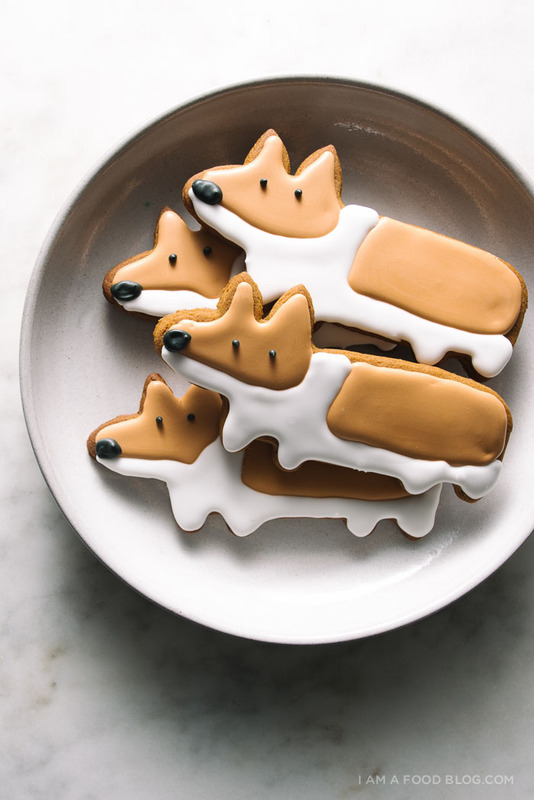 If you have a corgi lover in your life, or if you just love gingerbread, I hope you give these cookies a try. The gingerbread recipe is one that I’ve been making for over ten years, adapted from an old photocopy of a recipe that my sister-in-law gave me back in the day – to be honest I’m not sure where the recipe is from. I like it because unlike other recipes I’ve tried, it’s not too hard or crispy, even once it cools. I also upped the ground ginger in it to make it extra gingery. 1. If the recipe you’re using has a chilling time, make sure you chill the dough, it helps prevent spreading when you bake. 2. In a similar vein, if I have the time, I’ll actually chill the cut out cookies in the fridge. 3. Let the cookies cool completely before icing otherwise the residual heat will cause the icing to melt. 4. It’s best to let the icing “cure” overnight. Sometimes it looks dry but it’ll dent. 5. Practice! I really does make perfect. Plus if your cookies don’t come out looking how you want them to, you always get to eat them. Have fun with it! Oh, and let me know: corgi or dachshund? 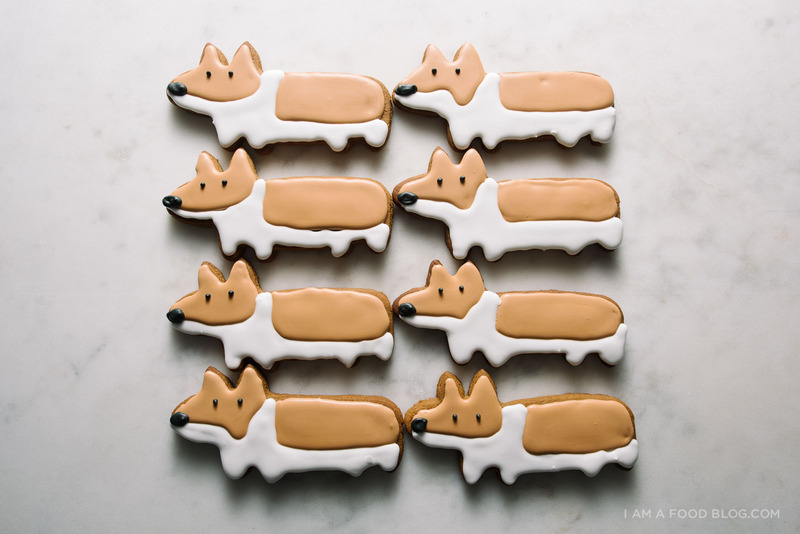 PS – Here’s the link for the corgi cutter! Sift the first 8 ingredients into a bowl and set aside. In another bowl, cream the butter with the sugar and molasses until fluffy and light. Beat in the egg yolk. Stir in the dry ingredients until mixed well. Divide the dough into two disks, wrap with plastic wrap and chill for 1 hour minimum. When ready to bake, preheat the oven to 350°F. 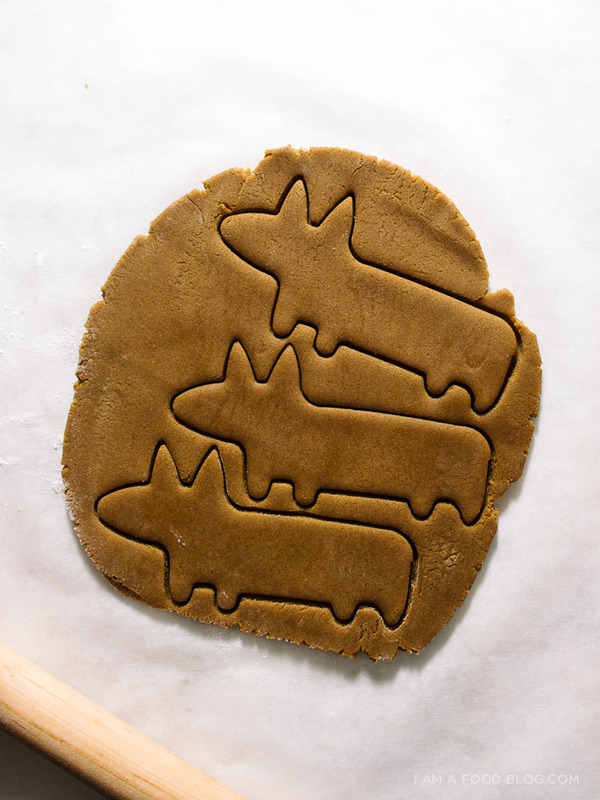 Roll out the cookies, cut with a corgi cutter (or desired shape) and place on a parchment paper lined baking sheet. Bake for 10-15 minutes, depending on size. Let cool completely before icing. To ice: outline the orange/brown parts of the corgi and fill in. Outline the white parts and let dry for 1 hour. Pipe on the eyes and noses. Let dry overnight. I used this royal icing recipe and I found that it worked really well. But if you don’t have meringue powder, I’ve also used this one, and it works equally as well. If you’re looking for icing tips, check this out. It’s Corgi’s in our house. They are very smart, loyal and have giant hearts. They are great with kids and you won’t find a better friend. I have also had Doxie’s which are great little dogs but the Corgi’s captured my heart! Haha oh my gosh this is so cute! I have a corgi and I love him to death. They’re very cuddly loyal creatures and are easily trained – I highly recommend getting one! precious! i’m absolutely infatuated with corgis and i’m not entirely sure why…except that they’re just stinkin’ adorable all the time. Those cookies are incredible. 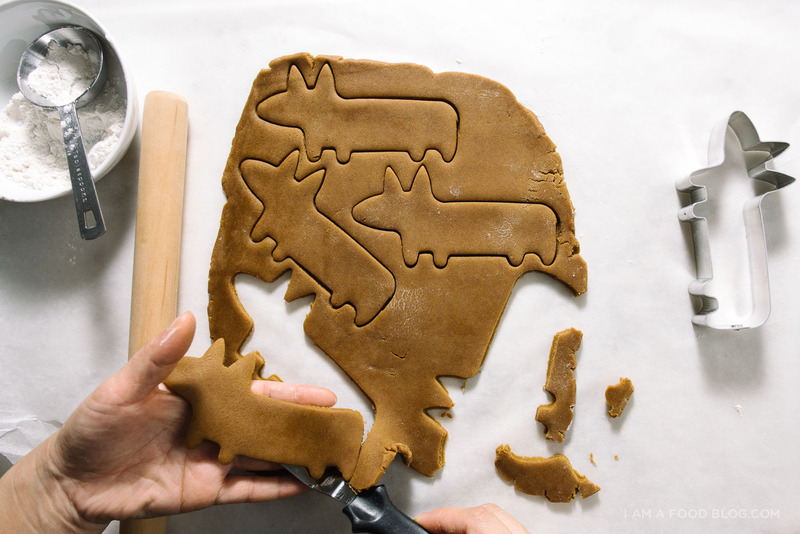 I need that cookie cutter in my life immediately! I love my dachshund like crazy. They have great personalities and are champion snugglers. One word of caution with them: they bark like maniacs. I have to keep a squirt bottle by my front door, because even at 9 years old, mine can’t calm down when people come over. OMGGGG you know I love this!!! I’m totally Team Corgi because doralucycorgipants.tumblr.com. That being said, dachshunds are awesome little critters, too. The main difference to me is the hair. Corgis shed A TON. Which I guess didn’t matter to me, cause Dora is THE BEST DOG EVER! So adorable and they look delicious also! Just stumbled upon your blog and love it! Not to be biased, but I love corgis. They’re the best. 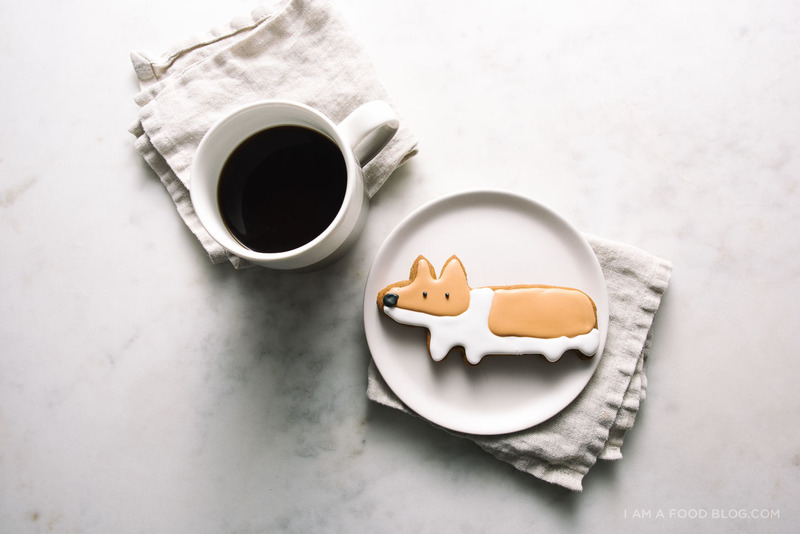 Having one since a puppy, they’re fun, silly dogs and incredibly loyal and smart :) These cookies are the cutest! So cute! I don’t have a corgi of my own, but I am a proud corgi auntie and my fluffy niece is the cutest thing. Corgis forever! These are SO cute!!! I would get a corgi. Not that I’ve ever had one, but they are ridiculously cute; cuter than dachshunds for some reason. At least to me. Where in the world did you find the cookie cutter? 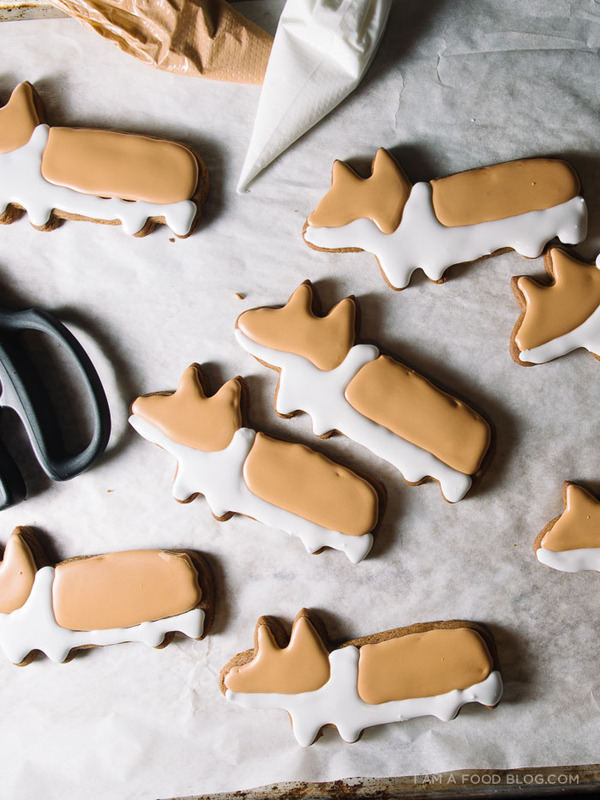 Please tell me where I can get this corgi cookie cutter!!! this made me smile SOOO much! I love these. And you are a cookie decorating master! 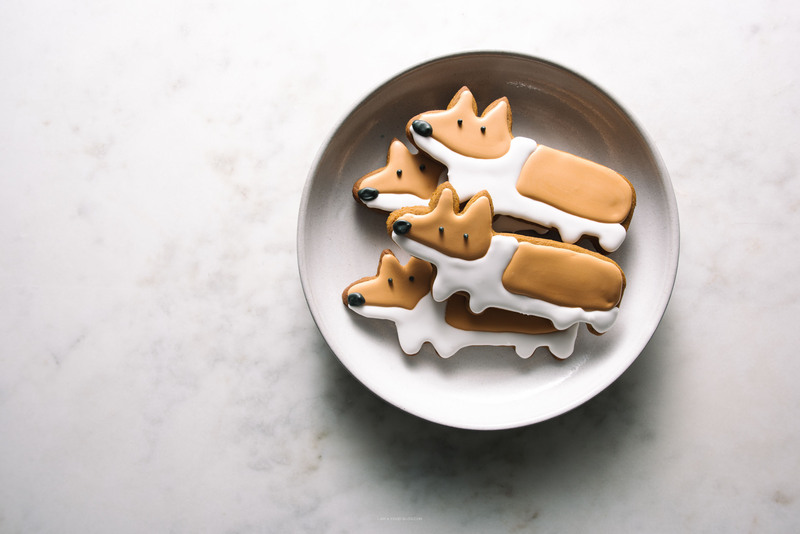 Oh my giddy aunt these corgi cookies are the cutest!!! Seriously adorable. 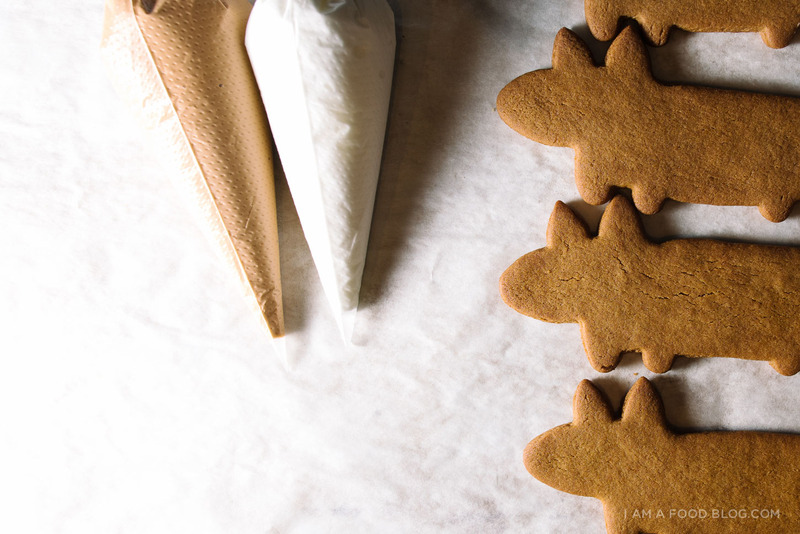 It’s still so cold, I think it’s perfectly okay to make gingerbread! Corgi! Definitely get a Corgi…from a reputable breeder that will match a puppy with you, your family, your expectations! Corgis are smart and will take direction. Talk to some Dachsie folks and learn how incredibly independent (stubborn) Dachsies are, really! Love the cookies and your decorationvis great! You are one talented cookie maker! Super inspired. I wish I were that talented since many in my neighborhood have corgis, what a great gift for them. Oh my god, these are too cute to eat!!! I have two corgis at home and I have to tell you that I’m extremely biased when it comes to picking between daschunds and corgis, although my family has had both. Corgis are funny and smart and so dang cute. They look like bunnies as puppies! My younger corgi is actually sleeping upside down next to me on the couch as I’m writing this. They’re fantastic. These are TOO cute! I wonder if doing black and white dogs would make it look like a borde collie! I used to have a border collie and know my mom would die love them! You really should get a Dorgie, its a combo of your two favorite dogs! I have one and LOVE LOVE him so much. He is a rescue dog. These cookies are adorable. Thank you! 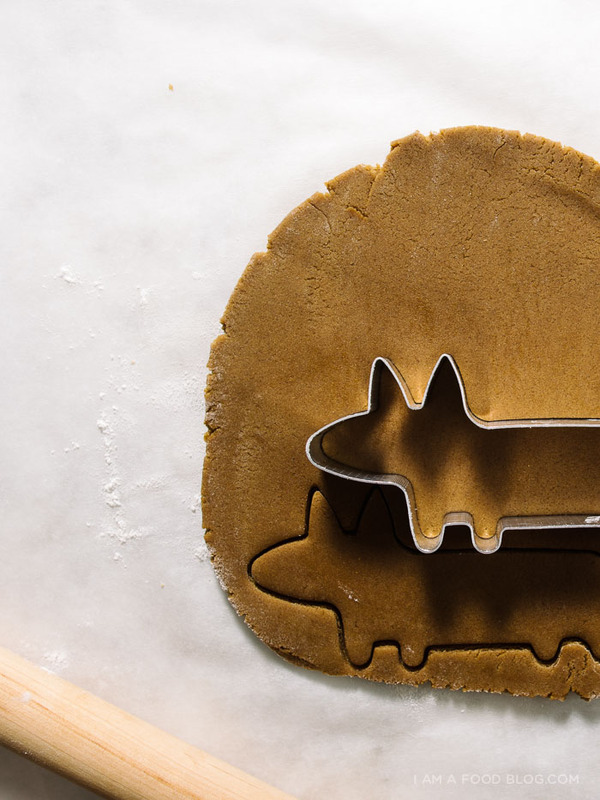 Where did you find the corgi cookie cutter ? I have a friend who loves corgi’s, and the love of her life has just been diagnosed with cancer. I’d love to be able to send her some of these cookies as a surprise, to let her know I’m thinking of her. Thank you so much ! they have one with a tail though! 👍🏻1 for Corgis! We have had four. Two are no longer with us but they each have a unique personality and they are super smart. That said, expect to clean up another corgi worth of fur every day: they shed a LOT. Plus they can “sing” too, although neither of the youngers have yet. (Honestly pretty sure they are not quite corgis. Right shape and profile but way too tall and twenty-five pounds heavier than they should be without being terribly overweight.). And corgi puppies are SO CUTE. so cute can’t even. These are too cute for eating! Hmm it is pretty hard to decide between those 2 breeds, but I’m on #teamcorgi b/c #fluffybutt! Words can’t describe how cute these are. Thanks for the inspiration and inspiring a YouTube binge of corgi puppy videos :). these are the absolute cutest cookies in the world! This might be the cutest thing that I have seen in a long time! I definitely need to get a few more cookie cutters! Great blog! Corgi all the way. My mom has a corgi and that dog is my spirit animal. She is just awesome and so much fun. Both! I have a corgi and a long haired mini dachshund. Corgi is a lot more work with the shedding and higher energy, but more fun. Wiener dog seems to be more curious – herding vs hunting dog. you should get a corgi!! they are just the cutest doggies in the entire world and they can even be trained to bring you things, like mine!! post a picture if you do, please!! These are adorable. Almost too cute to eat but I am pretty sure I would be able to overcome that. Amazing photos and recipe! I just showed this to my wife and she already is writing down what to buy at the grocery store! We cannot wait to make this, thank you for yet another great share! Oh, and I love that I now have an excuse to eat ginger bread cookies year round now and not just during the holidays! I saw good your blog and your dog gingerbread is so~~~~~ cut. I don’t eat this but i will hope eating gingerbread. If my circumstances are good(?) I will try this. That is absolutely adorable. I have a lab but my childhood dogs were wiener dogs. Thanks for brightening my day. Love these! I am going to make a huge batch of these for the oncology department that saved my corgi’s life. He was announced cancer free two days ago and I owe that team everything. I have a question about the coloring you used because I would like to copy what you did as best I can. What coloring(s) did you use to make the brown/orange color? Thank you! i’m so happy your corgi is okay! i used americolor gel: warm brown mixed with a bit of orange. you can use any brown mixed with orange, but it’s best to use gel food coloring so it doesn’t dilute the frosting too much. hope that helps!